One of America’s favorite pastimes is having a cookout with family and friends. As an outdoor extension of our house, the deck is often where we gather to celebrate those special events or just have a simple dinner. Sometimes weather conditions can prevent the backyard BBQ. Don’t let Mother Nature spoil the fun! If sun or rain are limiting the use of your outdoor deck, a deck pergola is one option for outdoor protection. Deck pergola kits attached to your house or standing alone can provide some shade or cover from the rain. Other ways to create protection from the elements on your otherwise open deck, include awnings and shade sails. With pergolas, you can combine your options and include a retractable canopy or pergola cover with your pergola and offer a bit of relief from the elements while you relax on your deck. There are many size pergola kits that can be installed on your deck. We’ll start by reviewing the sizes and types of pergolas we offer and how they might work with a deck design. There are two configurations for deck pergola kits, freestanding and attached. Attached deck pergola kits can be attached to an existing wall to create a covered area that extends your usable outdoor area. Pergolas can also be built so they are stand-alone on the deck in any corner or section that you’d like to create a sitting area. Allow enough space to create a dining area, as well as a place to create the gourmet meal you’re serving. Expand the use of your deck with an attached pergola that adds protection and beauty! Freestanding deck pergola kits also create an extra space on the exterior of your home. Add a touch of class to your backyard with one of our cedar pergolas and make your deck or patio the talk of the neighborhood. One of the most popular outdoor structures, wood pergolas add a unique design feature to any backyard deck. Our wood pergola kits are constructed using the highest quality lumber and hardware. Create a brand new look in your backyard that’s also functional. The best pergolas for your deck are those that don’t take up the entire deck area. 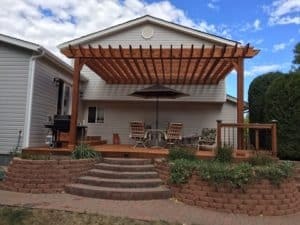 This attached pergola works well because it only has two posts on the deck and leaves plenty of room for a table and chairs. Measure your deck and find the amount of space you’ll need to allow for installing some planter box kits, setting up your favorite dining table, and leave room enough for your backyard party guests to mingle. 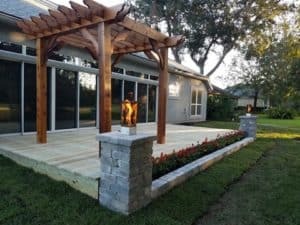 If you live in a cooler climate, the best pergola kits to reinvent your outdoors are those that can extend out the back door onto your deck or patio. This can stretch the length of time you’ll be able to spend time outside on your deck. Add your own decorative touch with pergola accessories such as string lights, curtains or vining pergola plants. In the warmer months or warmer climates, it offers a welcome relief from the hot sun to create shade on your deck. 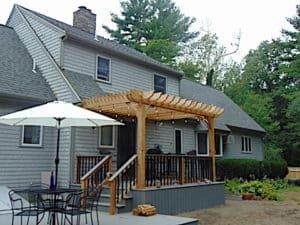 What type of deck cover can provide some light to filter through but also offer respite from the hot sun? Pergolas with top slats that allow some light to come through are some of the best types of covers. With rafters and top slats, you’ll create enough coverage to shield the direct sun, while letting a little sunshine peek through for a magical effect. Our Big Kahuna Pergola Kits have the most lumber of all of our pergola designs, followed by our Sombrero Pergola Kits, then Fedora. Choose the one that offers the highest number of top slats, as that will create the most shade on your deck. Add a retractable canopy for even more shade. 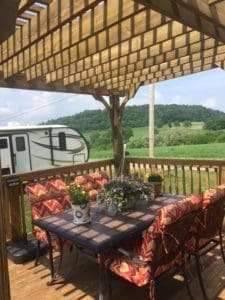 Where do you start to get your deck set up with a cover? Measure the area of your deck and figure out what size cover you’ll need. Then decide how much shelter you’re looking for. If you’ve decided on a pergola for your deck, choose your style pergola according to how many rafters and top slats you’ll need to create your ideal outdoor retreat. Our pergolas can be installed on decks and you’ll have an instant cover. Follow a few simple steps, and you can be happily sitting on your deck under your new deck pergola.